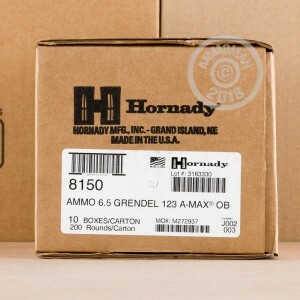 This 6.5mm Grendel ammunition from Hornady is just what you need to turn your AR-15 into a match or deer rifle. The 6.5mm round delivers better power for midsize animals than the .223 Remington, firing a heavy 123 grain polymer-tipped hollow point A-Max bullet at 2,580 feet per second. 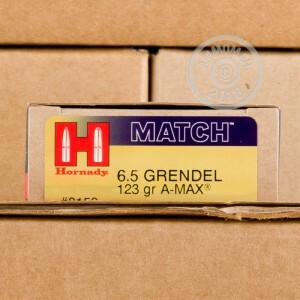 The boat-tailed, polymer tipped A-Max bullet is one of Hornady's own designs. It produces minimal drag and superb accuracy. When used against game, it delivers excellent terminal ballistics and quick kills. 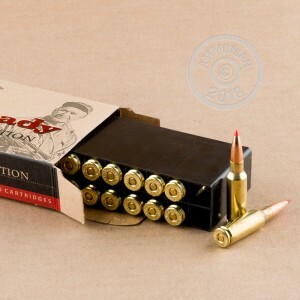 These cartridges use non-corrosive Boxer primers and brass casings. Pick up this case of 200 (20 boxes of 10) or any other items over $99 at AmmoMan.com to get free shipping!